Week 7 of the Folly Frenzy Countdown! Featuring: the Chinese Pavilion. I am very fortunate to have been able to do some folly reconnaissance in England two summers ago. It was a whirlwind tour of 18 gardens in 16 days and it was pure heaven! All but 2 of the gardens featured at least one folly while five of the gardens were devoted primarily to follies in the landscape. One of those such gardens was Stowe Landscape Garden in Buckinghamshire. One important and historic folly that we wanted to replicate for our exhibition was the Chinese House at Stowe. Built in 1738, it is folly with historic relevance and to an historic garden attached to a museum of American decorative arts, that is a win-win! Overall photo of the Chinese House at Stowe. Filled with detail! This folly is an example of Chinoiserie, or the European interpretation and imitation of Chinese and East Asian artistic traditions. 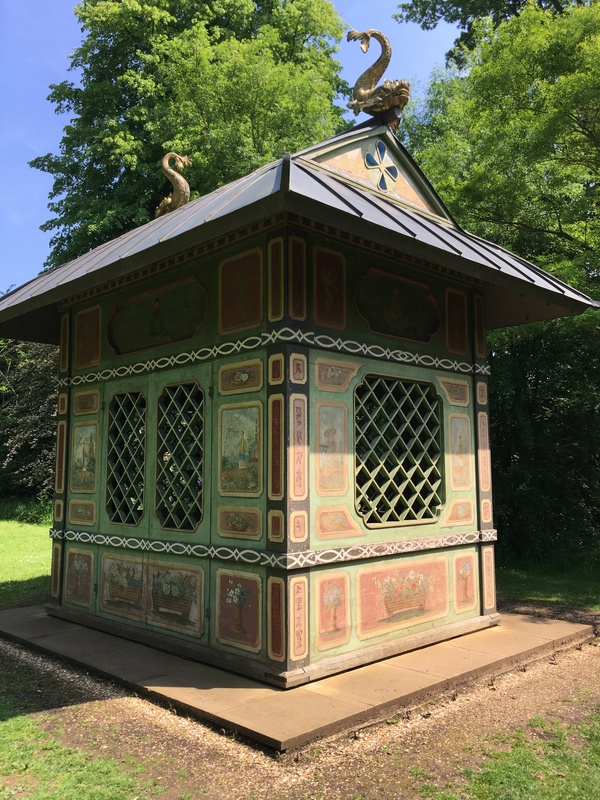 A folly of this age has also seen some sights; originally, sited in water, it moved around in England and Ireland to return to Stowe in a new location, restored…, and now has moved, in spirit, to the US for an even more western interpretation of its design. 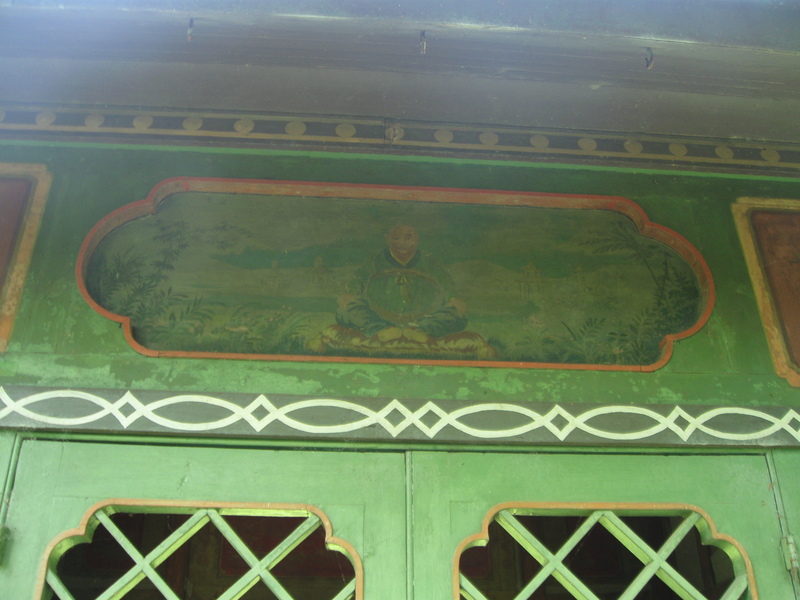 Close up of a painting with the Chinese House (in water) in the background. 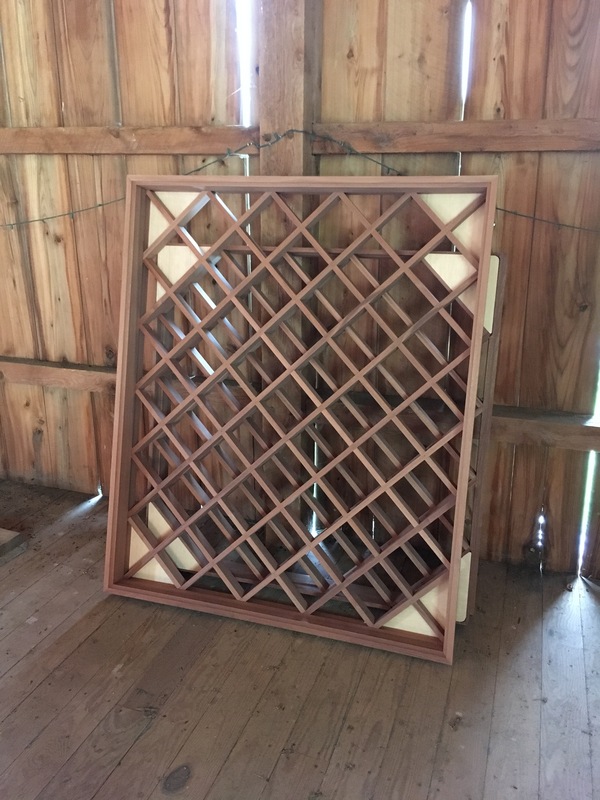 After copious documentation of the Chinese House (photos, drawings and measurements), we approached Rob McKeown of Elk Creek Cabinetry to see if he wanted to recreate this folly and Rob was up for the task! So as Rob was busy building the structure, we had to come up with how to decorate it. 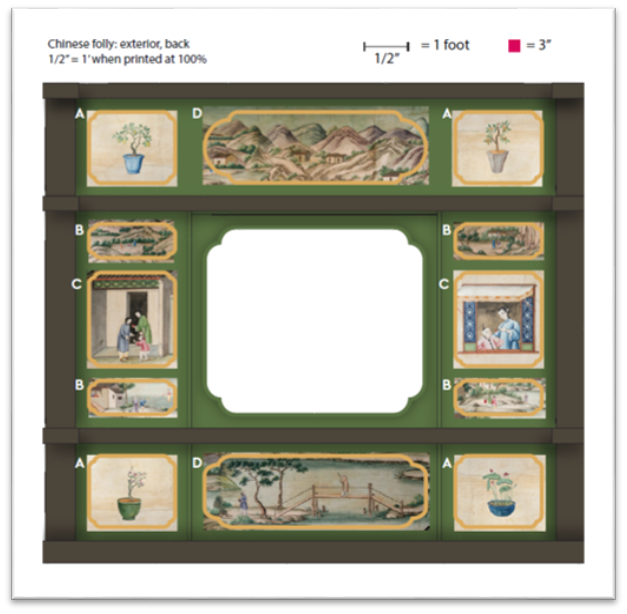 The original folly is embellished with hand painted pictures, evoking the look of Chinese paintings on glass. We knew that we could not replicate that artistic talent but used some techniques implemented by our exhibitions team to create the effect that we desired. 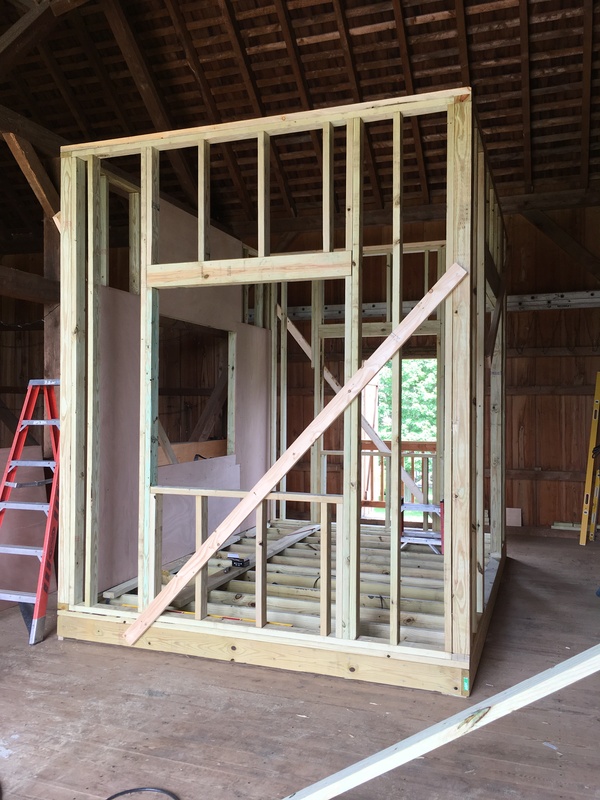 And so it begins…framing of the folly base. Finished lattice and interior paint colors. A template was created of the placement of the paintings on the original folly and then we looked within our own amazing collection for inspiration and found it. 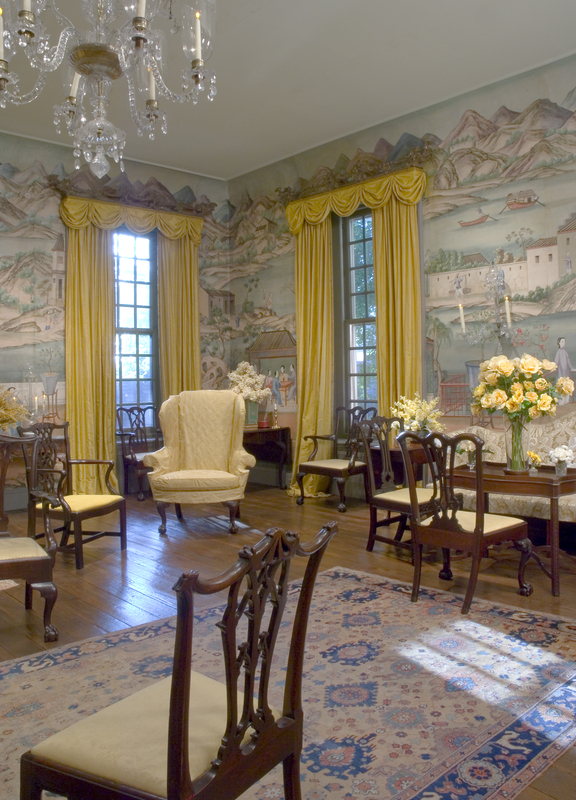 The outside images are taken from scenes in the late 18th century, hand-painted Chinese wallpaper in the Chinese Parlor, and the interior is wallpaper from the Port Royal Entrance Hall. The Chinese Wallpaper in the Chinese Parlor. 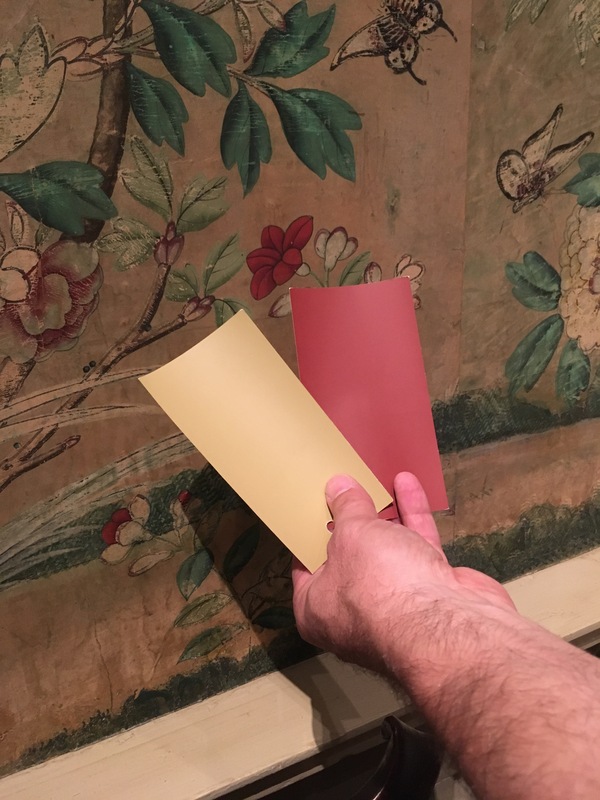 Nat Caccamo with paint swatches against the wallpaper in the Port Royal Entrance. High quality, close up photography was taken of images of the Chinese wallpaper that could be used in our interpretation of the exterior paintings. The interior of the Chinese House was less distinctive and appeared to not have been fully restored so we opted to draw inspiration yet again from our own collection and replicate the wallpaper in Port Royal Entrance Hall, but still use the molding pattern from the interior of the Chinese House. All of the photographs are then placed on weather resistant, 21st century materials. Where science and art meet. 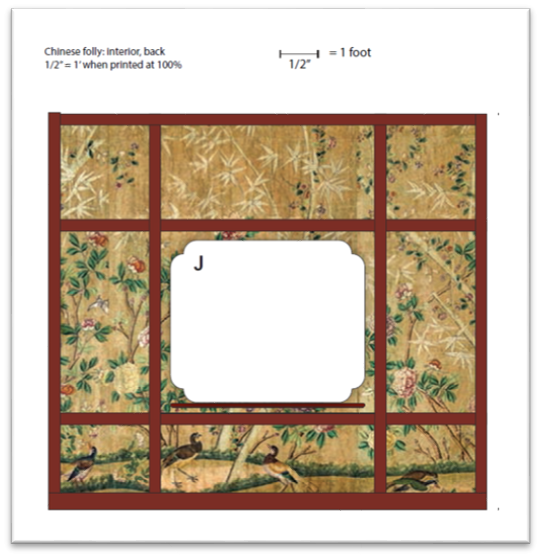 Template for an exterior wall using images from the Chinese Wallpaper. 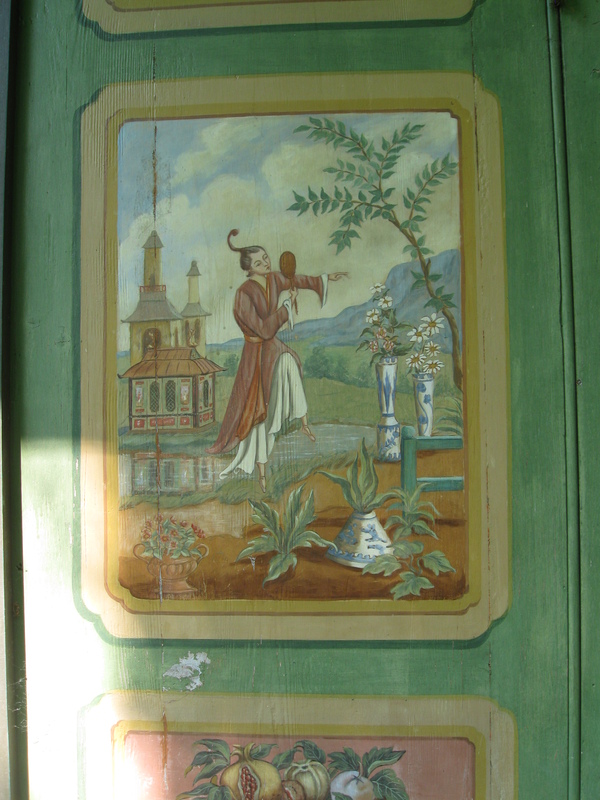 The designs on the exterior molding of the original folly were all done in free hand. 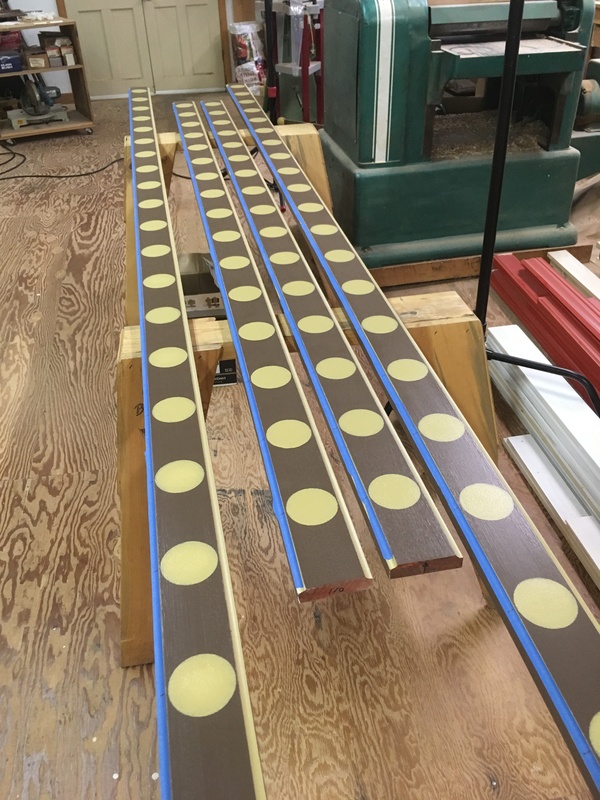 We replicated the “dot molding” as we ended up calling it, by Rob routing out the molding and painting it to create the outer lines followed by me “going to my happy place” while stenciling dots. Dot molding complete and no, I wasn’t seeing spots! 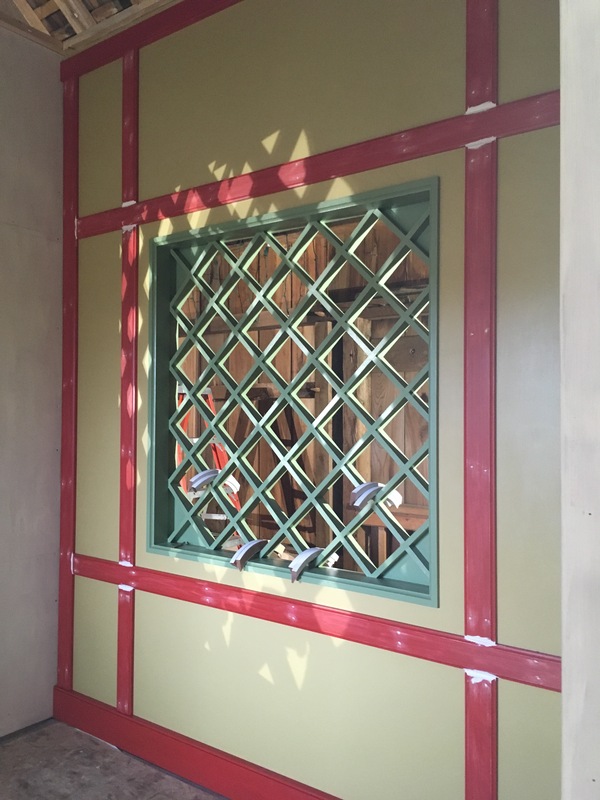 The ribbon molding (as we refer to it on the original) went beyond our stenciling expertise and after much consternation, we came to the conclusion that this is our interpretation of the Chinese House and since we were changing other aspects of the original design, why not that? 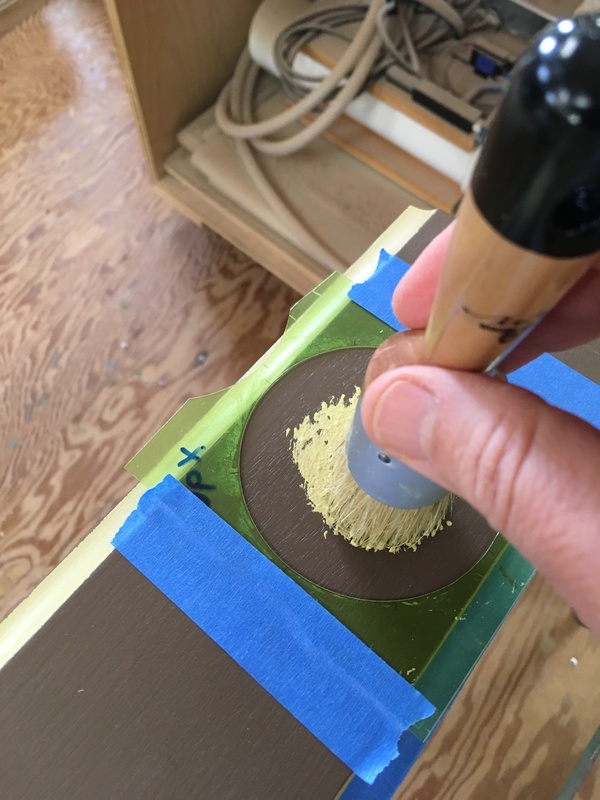 Again, the solution was the routing out and painting of molding to create another complimentary repeat pattern. Close up of molding details. “Dot and Ribbon Molding” as we refer to it. If you can’t beat ’em, join ’em. Folly with Christmas lights! 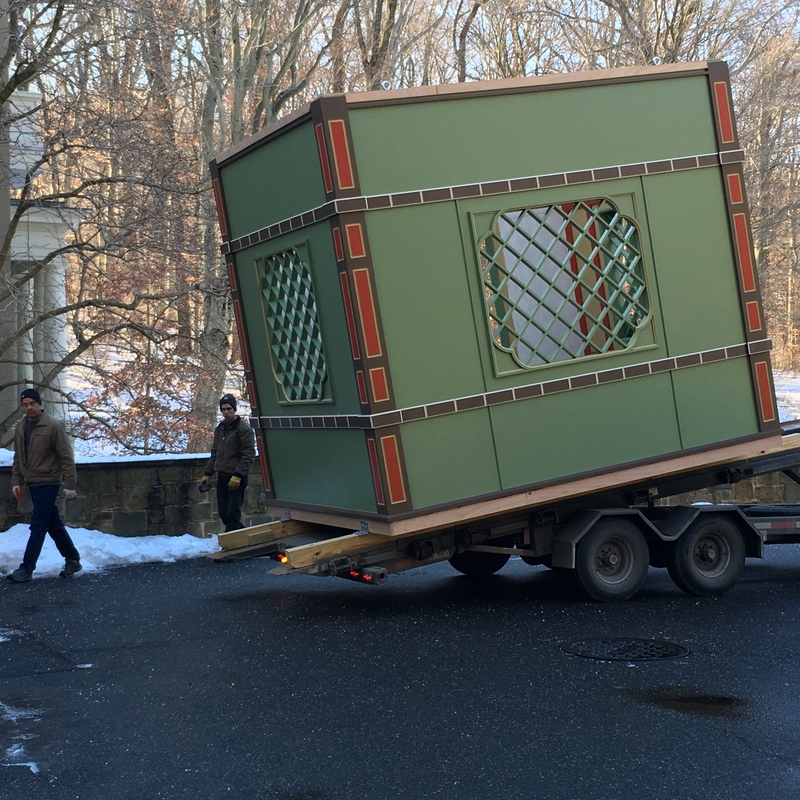 Delivery day came and the follies made a trek from their locations, up I-95 to the West Side of the Galleries. Can you imagine the quizzical looks as drivers passed this on the highway? 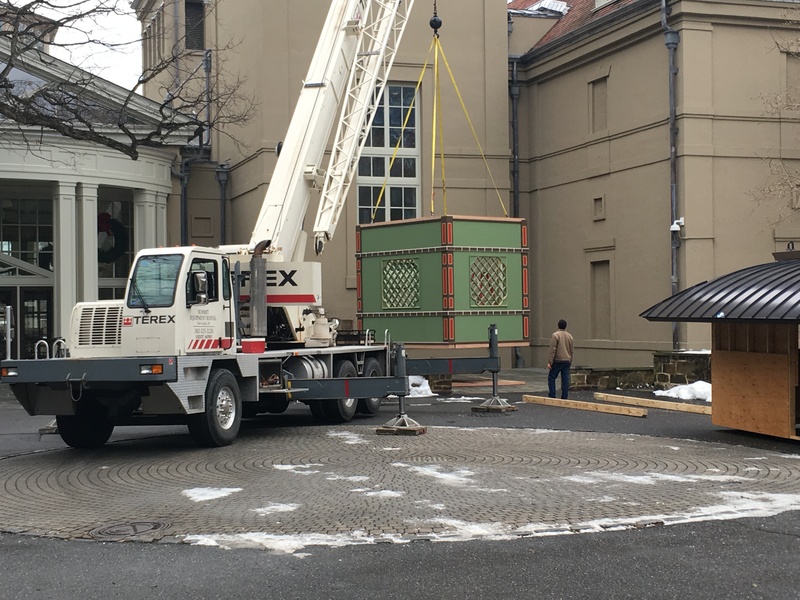 The next day, a crane came on site to place the two pieces together. Base of the folly being delivered on site. Crane placement of the base of the folly with the roof waiting in the foreground. 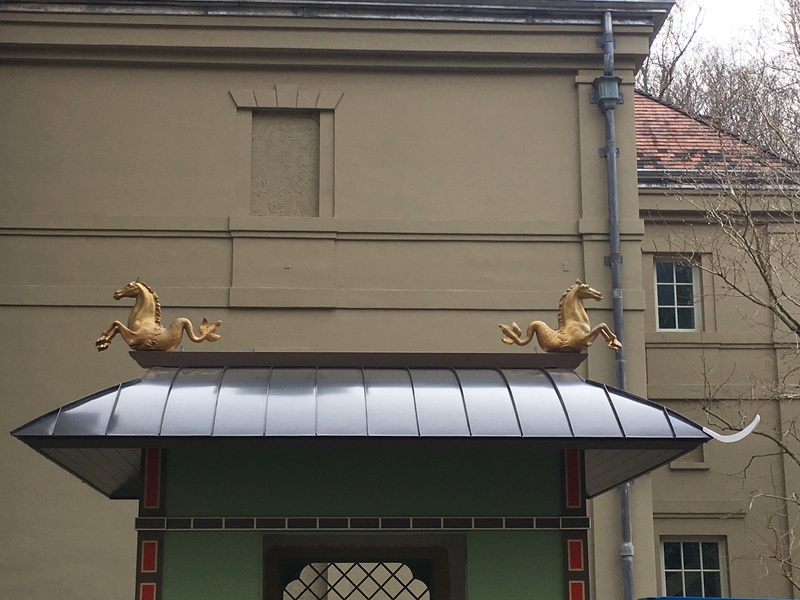 The stylized dolphin finials on the original were changed again to a more Winterthur-style aesthetic, the Hippocampus. The current Hippocampus in the Reflecting Pool was replicated from the original lead sculpture that sustained damage over the years. 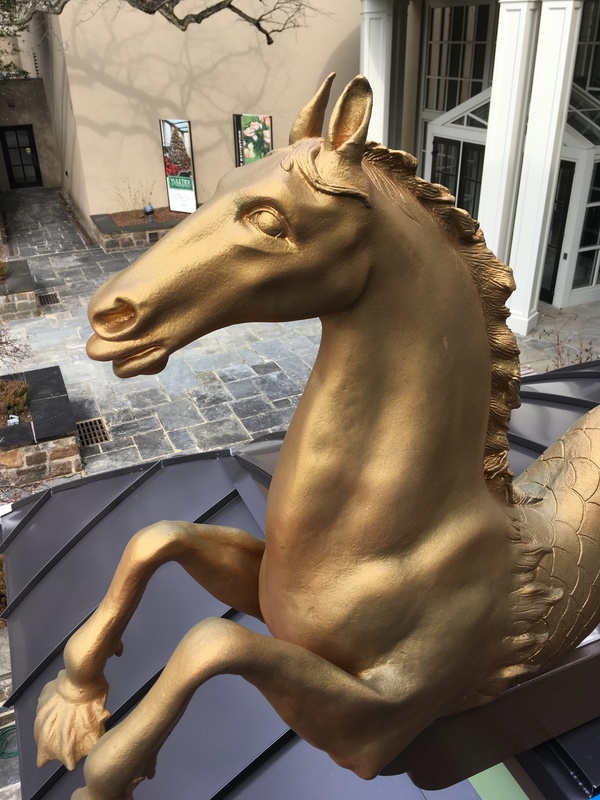 We reused the mold and with the help of objects conservator Adam Jenkins, a graduate of the Winterthur/University of Delaware Program in Art Conservation, two new lightweight, gold-tone finials were born! 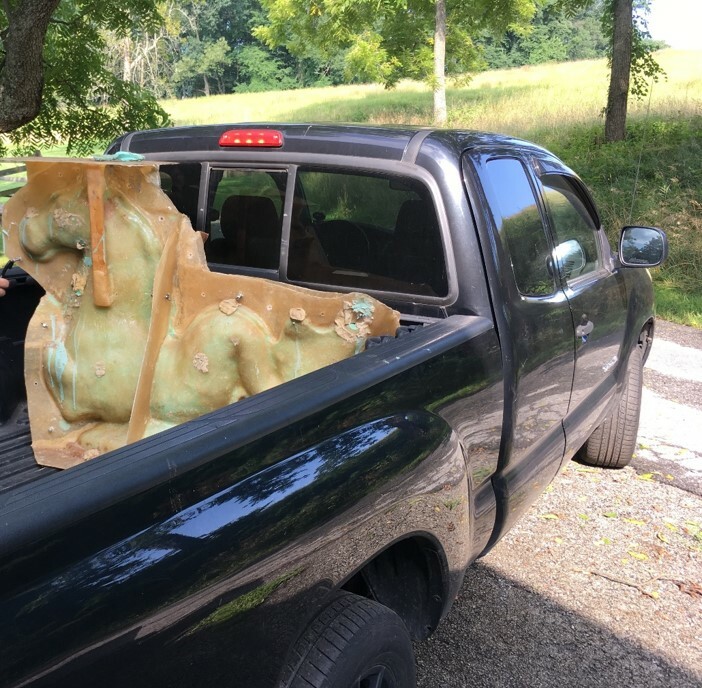 Hippocampus mold off to make us some finials! Unpainted Hippocampus getting fitted for attachment brackets. A viewpoint that most won’t see. Hippocampus in their new home! 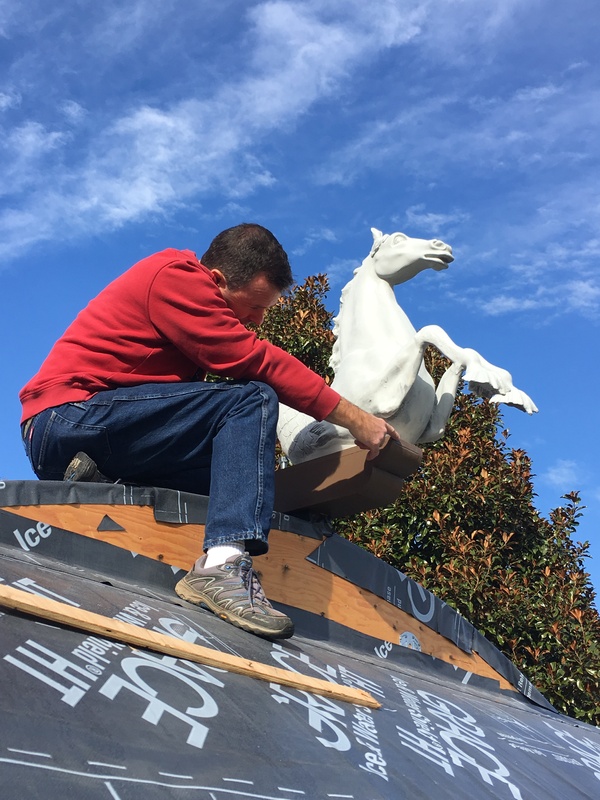 As of this writing, the interior wallpaper and exterior pictures await installment and the final touch will be the Chinese calligraphy on the red side panels of the exterior. We are working on the content so brush up on your Chinese characters to see what it says! If you haven’t caught folly fever yet, that’s ok, there is still time. 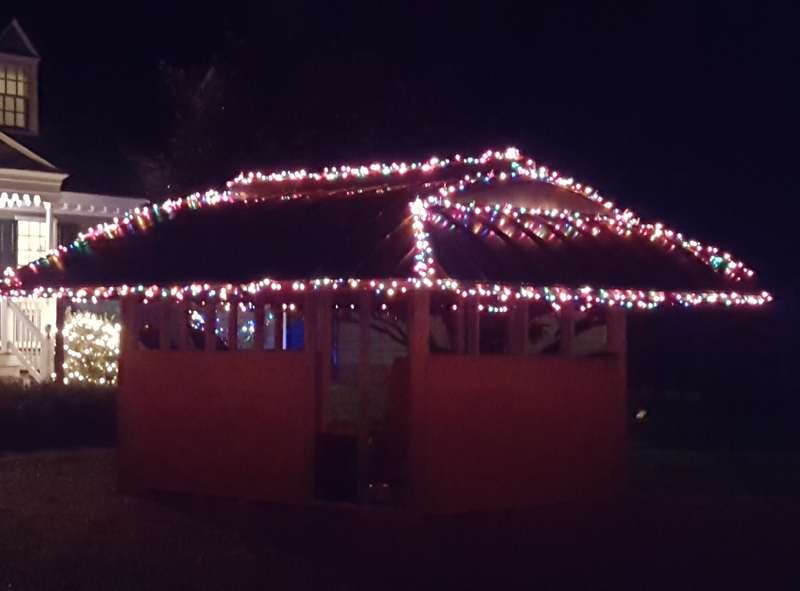 You saw how Rob strung lights on the roof of the Chinese Folly and folly fever even worked its way into our gingerbread contest at Yuletide…who knows how it might inspire you. 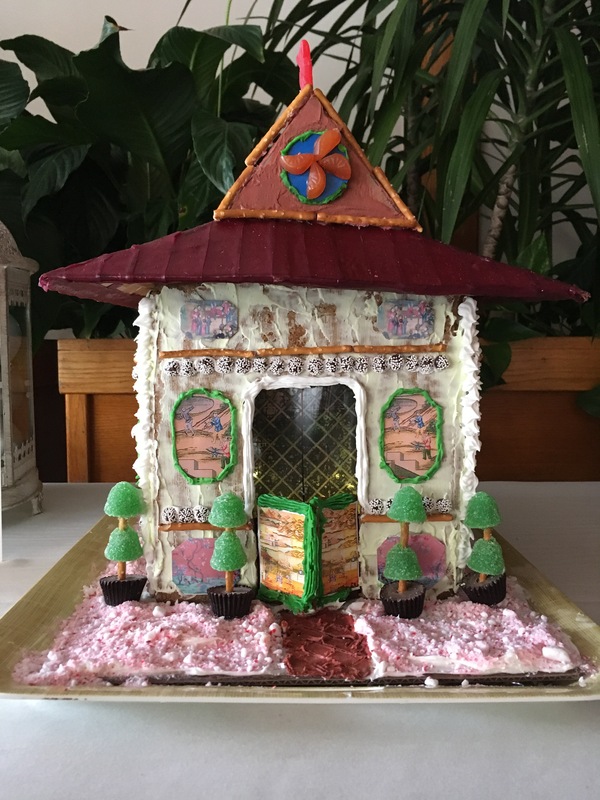 The Chinese House served as an inspiration for our Yuletide gingerbread contest! A lovely account of what must have been a fun project. Also, glad to see you have been honing your British Museum cake skills as well as everything else. Thank you, Pippa. I am hoping that next year we will have a folly gingerbread house theme!